Some time ago, I developed a mashup using NodeJS and Couchbase to demonstrate how to use Couchbase to create stats and charts. Despite I still use Couchbase for many things in my day-to-day basis, it does not provide any comfortable way to perform free text search, so I moved to ElasticSearch for some projects. In this series of posts I show how to create a very basic NodeJS application that gets tweets from Twitter stream, stores them into ElasticSearch and get some charts about them. Indicating that the ElasticSearch cluster is running and ready to store your documents. 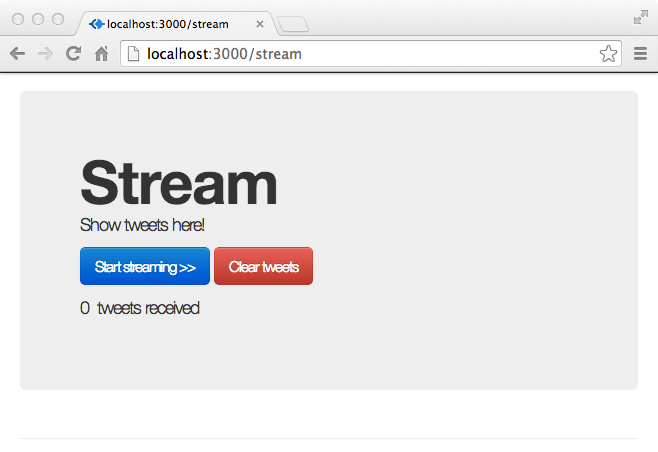 Now to http://localhost:3000, where you will see a simple website based on Twitter Boostrap. Click on the Stream button on the navigation bar and then on the blue button that says “Start Streaming”. By clicking on the button, a connection to Twitter’s Streaming API will be made and you will start receiving tweets. These will appear on the page above. Go now again to http://localhost:9200/_plugin/head/ and check that a new index has been created and the documents have been saved into it. And that’s it? No CREATE DATABASE? No schema? No nothing? Well.. Yes and no. The index (database) is created automatically and the mapping (schema) is created from the documents that you just inserted. This is a lot more trickier, but this will work for this demo (probably you noticed the parsing of the date… that’s one of the tricky parts). By default, ElasticSearch will index every single field of every document in the index, so that allow you to query by any of them. On of the most interesting parts of ElasticSearch are the facets, that we are going to use to create the chart on the stats page. Facets are aggregations based on data. Something similar to asking the database to calculate average, median… and many other things such an histogram. Read more about facets on the docs. What we are doing is using the search method of the ES client to query the database. We don’t want any results, so size = 0. But we want the histogram facet and we want it to count the tweets created at each minute. Check the docs for more info. The result of the ElasticSearch query is sent into a template and rendered as a Javascipt variable that is later parsed by amcharts (See routes/tweets.js and public/js/templates/stats.ejs). And that’s it. On following posts I will explain how to perform advanced querying to ElasticSearch by adding more expressions to the “query” object (so, using a filter different from this “match_all”).